A Marine Died In A Battle. 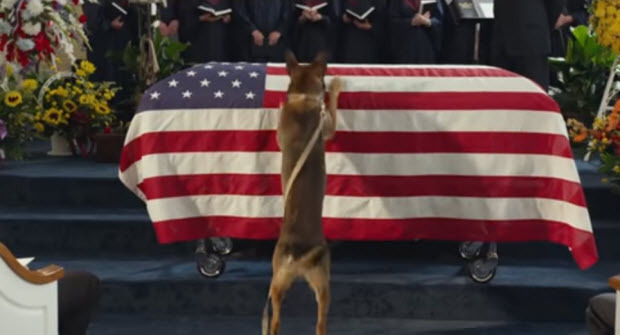 But What His Dog Did After The Funeral…Is Beyond Words! I am Speechless! It is a Movie That Deals With Heartbreak, Pain, Family, Friendship and War Wounds, Leaving its Audience Emotional. It is not only a movie for dog owners but anyone who understands the loyalty of dogs. It also touches on the important subject of PTSD that war dogs experience after war. The plot revolves around a Malinois, a marine dog who is handled by marine Kyle Wincott. Kyle has parents, Pamela and Ray, and a little brother, Justin, back home. In an insurgency, Kyle is killed and Max is left behind. When Kyle’s body is brought back home for the funeral the Marines tell the family that Max is not letting anyone handle him. However, Max senses Justin is Kyle’s brother and calms down near him. Max ends up going home with the family but his behavior is still a little aggressive. As the plot explains an important point, dogs who have been in the war also experience Post Traumatic Syndrome (PTSD). Many people just call such dogs aggressive. But the truth is that these dogs have seen a lot of violence and chaos and it has a very negative impact on them. In the case of Max, he lost his beloved owner Kyle and that, with the war memories, completely breaks the poor dog down. The story progresses as Justin, with the help of a friend, tries to help Max and looks after him. Large Dog Inside Small Cat’s Body! How Our Dogs Show Us Love. I Was Shocked To Find Out!